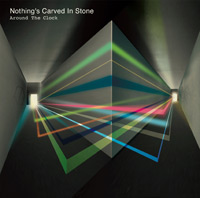 Nothing’s Carved in Stone’s newest release. They are actually a side-project of ELLEGARDEN’s guitarist since they decided to go on haitus. All of their lyrics are in English, which is pretty interesting. It’s pretty hard to understand most of the time, but they make great music! Around the Clock is an upbeat song which starts out with the band playing an extended intro. This group tends to use the higher range of the guitar a lot more than others and they make all parts of the music intricate. The bass guitar is always doing something interesting and the balance is very good. The vocals are awesome and I think that his English may have improved a little bit since it’s easier to understand. In the guitar parts, they tended to use many repeated notes, but they also made sections where it arpeggiates and becomes more interesting. Next up was Bone Age. It began in a quiet intro with guitar chords, but quickly transitioned to full-band. This song has a darker feel than Around the Clock and the guitar parts are more for harmony rather than melody in this one. That doesn’t mean that it’s uninteresting at all. As a matter of fact, I like the guitar parts in this song more! During the middle of the song, the vocals drop out and leave the band to play solos. The bassist does some slap bass, and a bit after that, the guitar plays a short solo. When approaching the ending, there is some piano adding scattered notes, but those stop after a little bit. The last of the new songs was The Swim. It’s a bit more lighthearted than Bone Age, but the vocalist sings in a lower range so it doesn’t quite reach the same happiness level as Around the Clock. There are lots of arpeggiated chords in the guitar part and those create both the melody and harmony interestingly. I really like their bass lines. They are always prominent and more complex. Great song! Along with these, they added in a couple live recordings. They’re really great quality and it shows their consistency in performance! Overall: This is a very strong release. I love how the instrumental section is always rather dominant and more interesting than just repeated chords over and over.